The Ranch is proud to welcome back the PRCA Ram Mountain States Circuit Finals Rodeo to Loveland, October 25-27. Doors Open Each Evening at 5:30 p.m.
Each performance begins at 7:00 p.m.
Groups of 10 or more can save up to $3 on tickets to Mountain States Circuit Finals! All new behind the chutes tour ONLY $27! VIP tickets include dinner with the Cowboys prior to the event, (1) drink ticket, an event program and a padded seat in the VIP seating area during the performance. (1) General Admission ticket to each performance. *Please Note: Only PRCA National Sponsor Card Holders receive complimentary access. All other Card Holders are required to purchase an admission ticket. Join the contestants as they receive awards both Friday and Saturday evening immediately following the performance. Enjoy live music, dancing and a cash bar while the awards are presented in the Ranch-Way Feeds West Pavilion. Come early before each performance and shop the tradeshow. Hand selected vendors will be on site selling tack, clothing, accessories, shoes, furniture and more! Ticket for performance required. On Saturday, October 27th at 6 p.m. put on your best costume and join us for Cowboy Trick-Or-Treat! Meet Mountain States Circuit Finals Cowboys and Cowgirls while showing off your costume. Kids 2-12 dressed in a costume will be eligible to enter the costume contest prior to the rodeo performance. A ticket for Saturday's performance is required for entry. 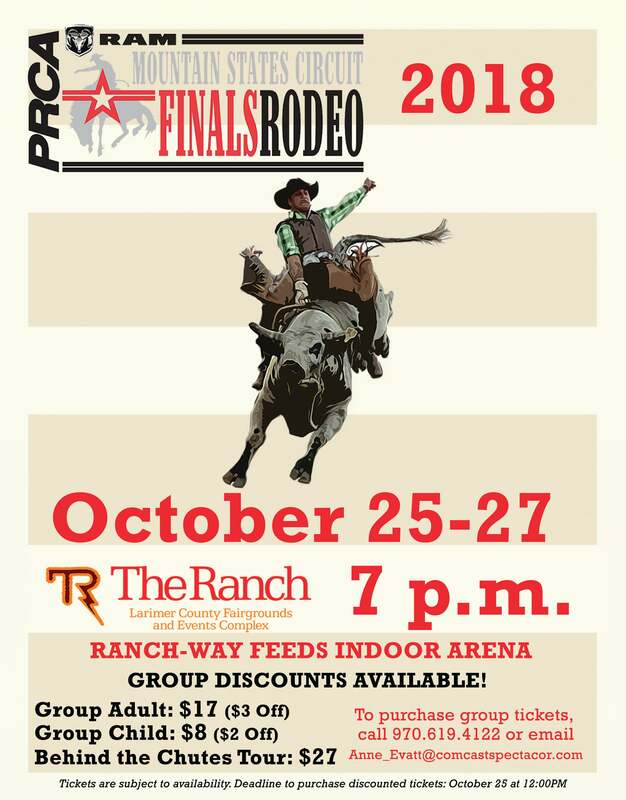 Check-In for the 2018 Mountain States Circuit Finals will be held on Thursday, October 25th from 3 - 5 p.m. in the Ranch-Way Feeds West Pavilion. Contestants will receive (2) wristbands for complimentary access to each performance; one for a companion and one for themselves. Reservations must be made through The Ranch. Please check back for availability. For additional information, please visit the Mountain States Circuit Finals website.